The following was first published in The Kent Ridge Common. A foreign counterpart of mine once asked me how our cabinet ministers performed during our 2006 General Elections. Admittedly, I did have great difficulties answering his question. My foreign friend hails from a western country, and the politics in his homeland is such that all the seats up for grabs during elections are contested by the incumbent candidate and opposition alike. Of course, I couldn’t give a straightforward reply. I could only recall that Mr K Shanmugam and Mr Khaw Boon Wan were among the best performing PAP candidates, garnering 77% of the votes at Sembawang GRC, and that our current Prime Minister Mr Lee Hsien Loong garnered 66% of the votes at Ang Mo Kio GRC. However, I promised my foreign friend that I would research on the current cabinet and get back to him later. When I finally got down to checking out the details of our current cabinet, what I found really surprised me. A little less than half (9 out of 20) of the cabinet ministers didn’t have to contest the most recent elections. They were given a shoo-in into parliament on the basis of a no contest in the GRCs which they stood in, winning on a walkover. Thus, technically speaking, I couldn’t tell my friend that Singaporeans voted for these ministers because the residents at their respective GRCs couldn’t vote in the first place. The 1988 General Election was the year when the GRC concept was first introduced. A GRC consists of multiple seats, and the requirement is that a candidate from a minority race (malay, indian or others) must be fielded. In 1988, the maximum size of a GRC is 3 seats, and has since increased to 6. Some GRCs are allocated 5 seats. Comparing the results of the 2006 General Elections to those of previous years yield interesting discoveries. The question that comes out of it is whether the introduction of the GRC correlates with an increasing trend of cabinet members entering office through a non-contest. It appears so as I also researched on candidates from walkover GRCs who were appointed to the cabinet during the 1991 General Elections. *Dr Richard Hu won by a walkover in Kreta Ayer, which is a Single Member Constituency. The introduction of GRC contest has various interesting impacts, many of which have been highlighted previously. And some of them have resulted in interesting trends, one of which has been discussed in this article. 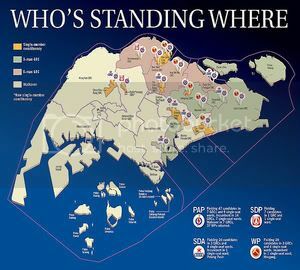 Thus, this give rise to pertinent questions regarding the nature of electoral contest within Singapore such as the implications of the walkover rule and whether the GRC concept has impacted competition dynamics.